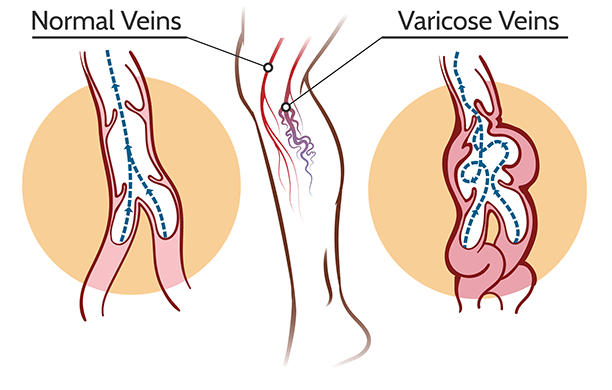 Venous insufficiency is most often caused by either blood clots or varicose veins. In healthy veins, there is a continuous flow of blood from the limbs back toward the heart. Valves within the veins of the legs help prevent the backflow of blood. The most common causes of venous insufficiency are previous cases of blood clots and varicose veins. When forward flow through the veins is obstructed, such as in the case of a blood clot, blood builds up below the clot, which can lead to venous insufficiency. In varicose veins, the valves are often missing or impaired, and blood leaks back through the damaged valves. In some cases, weakness in the leg muscles that squeeze blood forward can also contribute to venous insufficiency. Venous insufficiency is more common in women than in men. It’s also more likely to occur in adults over the age of 50.